It is a bee-utiful day on the interwebs. The virtual sun feels warm on my skin and the air is infused with the scent of freshly cut digital grass. Yes, we are making sustainable organic hay at Tapscape and ask you to ruminate on this — developers note the timely arrival of iOS 7 beta 3 and Apple Stores are offering instant $50 savings on HP printers. 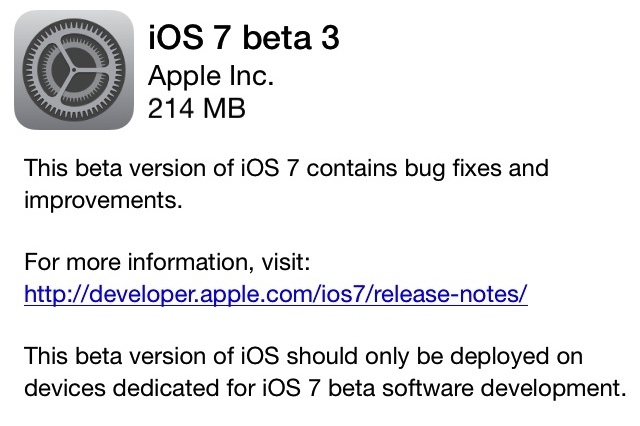 Developer lads and lasses, whether you go for the over-the-air update or the standalone download, Apple is seeding iOS 7 Beta 3. For what it’s worth, the whingers are already bleating that the icons, such as they are, have not been updated. According to PhoneBuff, iOS 7 Beta 3 brings significant changes to Safari, Control Center, Lockscreen and, most noticably, a change in the system font, which is thicker and easier to read. Next up with a have blast from the recent past. Although the marketing collateral has been distributed, it hasn’t yet been distributed — Apple and HP have partnered to offer instant $50 discounts on HP printers. Apple ended its long-standing $100 rebate on a printer with Mac purchase program back in January 2012 and few lamented its passing. This promotion, however, is a straight up discount that does not require a qualifying Mac or iThing purchase — just buy an HP printer and, boom, you get an instant $50 discount. The promotion starts July 9.